Canada's cable and internet companies defend themselves against claims they use misleading or aggressive sales tactics. The companies say the CRTC should target companies breaking existing rules rather than write new ones. Canada's cable and internet companies are defending themselves against claims they have been misleading their customers and using aggressive sales tactics to sell services they may not want or need. Four companies — Videotron, SaskTel, Cogeco Communications and Telus — appeared before the CRTC on Thursday. The commission is holding five days of hearings, investigating the sales practices of Canada's telecommunications firms and looking at whether new rules are needed to protect consumers. Tony Geheran, the chief customer officer at Telus, told commissioners there may be problems with the way some companies operate, but he assured them it's not a widespread issue. "I think our view is that there is not a systemic problem," Geheran said. "There are circumstances in certain markets with certain providers where the incidences of misleading or aggressive sales are a significant factor. And we feel they should be addressed." The CRTC is looking at whether a new code of conduct may be required for cable and internet companies to lay out clear rules for how they deal with customers. During their appearance Thursday, Telus representatives said the company would support a new code if it was national in scope and made it easier for consumers to file complaints. But their overarching message was that, right now, there is no shortage of rules. "We actually believe self-regulation is OK. We believe we would self-regulate responsibly and reliably," Geheran said. "But in the instances where a provider is not doing that, then we believe the powers already exist to take them to task. It's just not being enforced. So, will a new code do anything different? That would be our concern." That message — that problems with aggressive or misleading marketing stems from a lack of enforcement and not a lack of regulations — was echoed by other companies that appeared before the CRTC on Thursday. "Cogeco believes that there is no systemic telecom industry issue to be addressed by the commission," said Leonard Eichel, that company's senior director of regulatory affairs. "Cogeco believes that sufficient tools are in place to ensure that consumers are well protected." 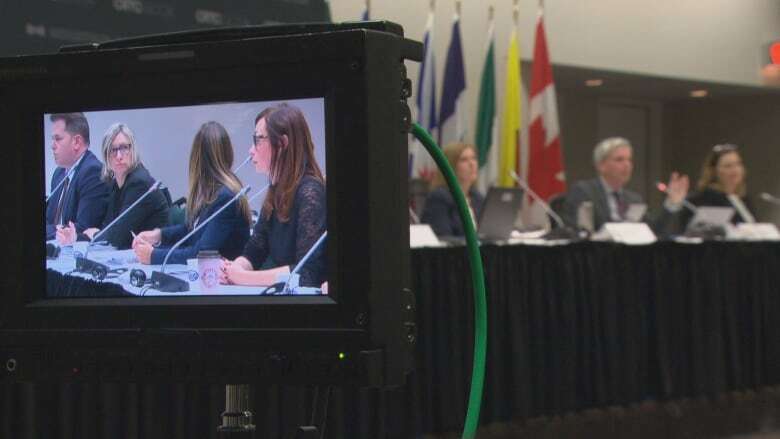 In its presentation to the commission, Saskatchewan's SaskTel said the CRTC should target companies that are violating existing rules rather than cracking down on the entire industry. "If there are some specific issues with specific carriers, there are lots of remedies available to deal with that," said executive vice-president John Meldrum. "You've got to get at the root cause. And if the root cause is one of the carriers or two of the carriers, you've got to go after the root cause and the number of issues and complaints will go down." Quebec-based Videotron, the first company to appear before the CRTC on Thursday, was just as forceful. "There's a telecommunications code, a wireless code, provincial laws, we have the Competition Bureau. The problem isn't with codes. The problem is a compliance issue," said Peggy Tabet, the firm's vice-president of regulatory affairs. Tabet told commissioners Videotron takes customer service seriously, and pointed a finger at larger firms like Rogers and especially Bell, Videotron's main rival in Quebec. She accused them of being responsible for the bulk of consumer complaints and, like others executives, argued for targeted measures by the CRTC and not sweeping changes. Representatives of Rogers, Bell and Shaw Communications will get a chance to have their say on Friday as the CRTC wraps up its hearings. Commissioners will report their findings to the federal government by the end of February 2019.